This is a really gourmet looking but so easy to make. If you are looking for something special for Mother's Day to impress her, this is perfect. 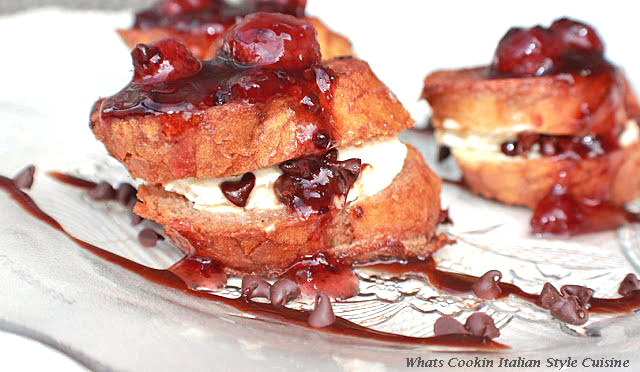 This stuffed French toast is so decadent and pretty as a picture on the plate. This Mother's Day will be very special if you serve mom with this delectable Cannoli Stuffed French Toast. Whether you make this for breakfast or brunch, it will surely be a memorable morning for both of you. If you want something that will impress your family and friends with a show-stopping breakfast or brunch, look no more. 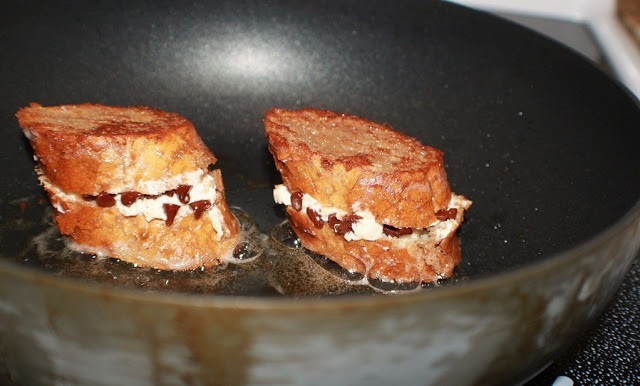 This is a delicious stuffed french toast that everyone will swoon over, especially on a special day for that special someone. Mine happened to be my mom for Mother's day many years ago before she passed on. Mom will always be in my heart and best friend. I always made something special for her on Mother's Day, after all, she cooked all year long and I learned from the best, she deserved a day of rest. This was a delicious stuffed french toast I made one year that she loved. I still make it in her memory. When Mom was still alive, I wanted to create something for Mother's Day one year that was extremely decadent and combine breakfast with her favorite dessert. That's where this idea came into play. Mom loved it. Over the years, as she grew older she had diabetes and I had to learn to make everything sugarless and of course, bread was a factor as well with the carbs. She had to limit herself to what she could eat and we replaced many of the ingredients to low carb and sugar - free. I was happy she got to enjoy this before that happened. With all the low carb bread and sugar-free jams andfresh fruits, it was easily recreated for her. Never the less she enjoyed this great brunch for Mother's Day. This is a really simple recipe, it looks gourmet but I assure you it's easy peasy! The ingredients are usual pantry ingredients except for the Marsala wine and the Ricotta. Everything else is easy to find in any supermarket to make this. I always like to keep the Marsala on hand since I use it for many recipes. Just check out the step by step recipe card below. This is such an elegant and decadent breakfast of Mother's Day brunch. If you want to wow your mom, this will do it. It's a really rich stuffed french toast and the berries make it just gourmet looking with the drizzle of melted chocolate on the plate. Do give this a try, you will love it! Melt the chocolate in the microwave just 1 minute and swirl it on the plate before the french toast is done to have it ready. Use tongs to dip the bread with, it will hold it together. The ricotta cheese makes this cannoli filling light, not too sweet and the berries are the perfect topping. A little drizzle of chocolate on the plate just to dress it up a bit looks stunning. Rich and filling with a little hint of that Marsala flavor make this a winner all the way around for that special someone. No matter what occasion, this Cannoli stuffed french toast is a wonderful treat! This is a special Mother's Day french toast I made called Cannoli stuffed French toast. It has all the flavors of a cannoli for breakfast made with delicious ricotta cheese and thick bread dipped into an egg mixture. Cut your bread every inch but not all the way through leaving a pocket to fill in between both slices. If using low carb sandwich together two slices. In a medium-size bowl, combine the ricotta, pinch of cinnamon, sugar to taste, and vanilla in a bowl until well combined. Then fold in the chocolate chips. Using around a tablespoon to stuff each pocket on the slice of bread, place on a cookie sheet and place in the refrigerator while making the topping, around 1/2 hour. In another small bowl cocoa powder, 1 teaspoon powdered sugar and cinnamon. Add the cocoa sugar mix to the milk, with two eggs. Add the Marsala and whisk together until well blended. It should look like very light milk chocolate in color and very smooth. Heat griddle or fry pan adding (I use only the oil) olive oil or butter. Coat each side of the stuffed bread slices in the chocolate coating milk mixture using tongs to hold the bread together. Cook on each for around 3 minutes or until golden brown. Place on paper towels to drain any oil off. On a plate drizzle some melted chocolate chips over the bottom with fork tines for a garnish. Place the cannoli toast on the plate then pour the berries over the Italian cannoli toast. 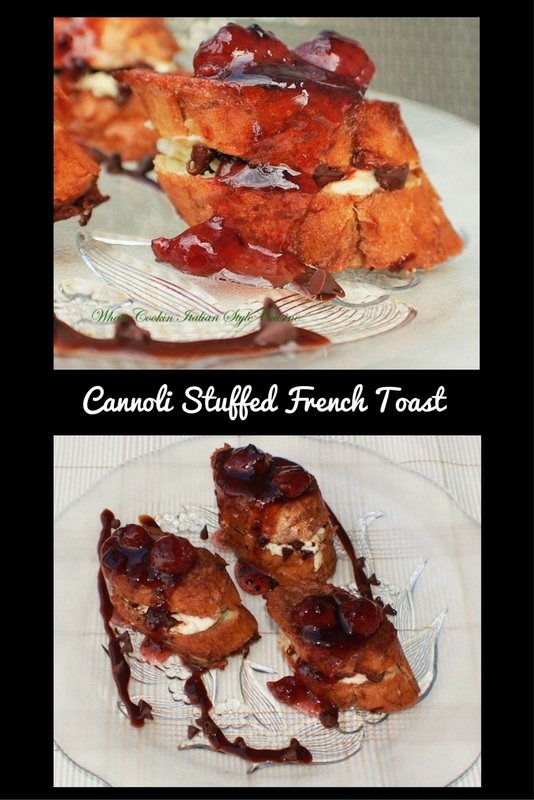 I love stuffed French toast and this looks so decadent and irresistible! !